We're enjoying an Indian Summer at the moment - with temperatures yesterday in the low 20s/70s. Unfortunately, the forecast for the next week looks unrelentingly grim: much colder, rain every day and the chance of a visit from Hurricane Sandy. Lovely! I decided to go and dig up some of the outside root crops before they all get drowned. 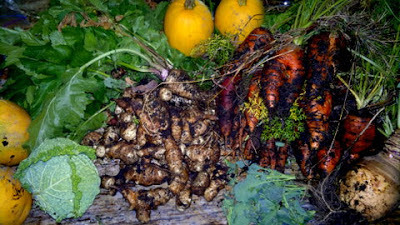 I got a good haul of parsnips, carrots and sunchokes, plus a swede/rutabaga, one of my Savoy cabagges and more broccoli. Since recovering from the dry summer, the broccoli plants have been doing really well and I've been picking it twice a week. I wish I could say the same for the Brussels sprouts, which look fantastic from a distance but which haven't produced a single sprout between them. And now it's looking almost as though there was never anything growing in it; just a few last spaghetti squash left to show how productive it has been. Considering the problems we had with the long dry spells in July and August, I was pleased with the amount of produce this bed delivered. Especially compared to last year, when squash bugs destroyed all of these plants in the vegetable garden by the house. The longer walk also provided me with some good exercise as I carried all the pumpkins, squash and cucumbers back to the house! I've been in Berlin for a few days on a business trip this week, with two days free at the end because of stupid flight pricing. Yesterday I went on a fantastic bike tour of the city centre with a group of other tourists from all over the world. That was great fun (especially the part where we were cycling through the Tiergarten: the park is really beautiful at this time of year). Today I headed for the botanical gardens. I got there just before they officially opened, but the entrance gate was already manned, so I paid my €6 and set off into the garden, armed with a printed guide to the best parts to visit in the autumn. For about half an hour I didn't see anyone else at all and felt as though I had the whole space to myself. It was a sunny, dewy, morning with just a touch of mist in the air. I wasn't expecting to see many flowers, so late in the year, but the trees more than made up for that. The season is less advanced here than it is at home and the trees are looking beautiful. The arboretum is full of interesting-looking small paths which beg to be explored: it doesn't feel at all formal, apart from the labels on the plants. One that caught my attention in the North American part of the arboretum was this witch-hazel (Hamamelis virginiana). I hadn't realised that this was native to our part of the world. Looking at its range, we're right at the northern edge of it, but it would be great if we could grow this in our woods at home. This is Cimicifuga simplex, otherwise known as bugbane. This is native to Asia, but the North American equivalent is Actaea (or Cimicifuga) racemosa, a.k.a. black cohosh, black snakeroot or fairy candle. Another one to look out for at home. I've never been wild about cacti, but there's something about this group that's almost cuddly. And did I mention that the trees were gorgeous? Having spaces like this almost makes it worth living in a city, although I must admit that I liked it best in that first half-hour when I felt I was only sharing it with the birds. By the time I left there was quite a long queue at the entrance, so the garden is clearly appreciated by the city's inhabitants and visitors. I thought the globe artichokes I grew from seed this year had been killed by the dry spell in July. But they came back from the dead once we had some decent rainfall and are now looking quite healthy. My next problem is whether they will survive the winter here. 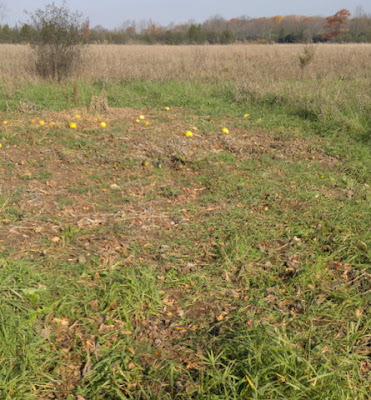 I think I'll cut the leaves back once we get a frost and then pile hay over the plants and see what happens. I grew one in one of the greenhouse beds, too, so that plant might have a better chance of making it through the cold season. Has anyone else successfully brought globe artichokes through a Great Lakes winter?